Poison ivy is very common. It can grow in your yard, a park, that prairie patch you go for a run, at campgrounds, on trails, anywhere. It's present in every county in Illinois. You can check the USDA distribution map for other states (clicking on a state will show information on a county level for that state). Poison ivy has no thorns. 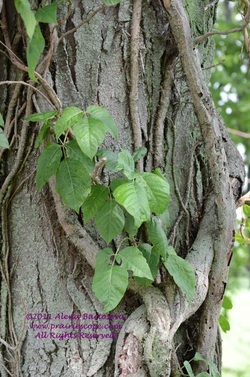 The vines climbing a tree are often attached to its trunk by numerous hair-like looking roots. These rootlets help to identify poison ivy in winter when leaves are not present. The flowers are small inconspicuous yellowish or greenish-white and appear in late spring through summer (see photo on right). Grayish white berry-like fruit can be seen in late summer to fall. Poison Ivy is easily recognized once you know how it looks. Well, most of the time. Often it's hiding in grass, like in the pictures on the left. Often it's climbing trees, like in the picture below. It can be a plant, a shrub, or a vine. However, the leaves always look the same. Another version of the popular rhyme is "Leaves of three, let it be." Poison ivy will always have three leaflets during growing season, never more and never less -- unless it's physically damaged. The leaves are alternate. The three leaflets connect to a leaf stalk that connects to a plant. The individual leaf stalks will alternate at connecting to the main branch so no two stalks will connect at the same place. The leaflets have one, couple, or none tooth; large variability can be observed even on the same plant. The leaves are somewhat shiny; bright green or red when young, turn green when mature, and colorful red, orange, or yellow in fall. Poison Ivy with unripe green berries. Fairchild Cemetery, Danville, IL. Any and all parts of this plant are toxic. Yes, the scientific name is a hint ... toxicodendron can be translated as 'poison tree'. Toxicondendron genus contains other trees and shrubs but all contain the culprit - irritating oil, urushiol. If you don't listen to the rhyme and touch the plant, the plant will leave traces of urushiol on your skin and you are in for a wild ride. The exposed skin will develop itch and rash. Depending on your sensitivity and the extend of exposure, this can be a minor blister or a major condition. Usually it takes a day or two up to a week to develop any signs of exposure but by then it's too late. The oil has already bound to your skin. Small percentage of people do not react to urushiol. However, repeated or increased exposure can lead to developing the sensitivity. The real key is to avoid or at least limit the exposure if at all possible. Wear long sleeves, long pants, and closed shoes, be careful where you step and what plant you touch. Learn to recognize poison ivy. Learn to look down and up and around. Be aware of your surroundings. That is the single best thing you can do to. Never burn any part of poison ivy; the airborne toxic ashes are extremely dangerous. Imagine all those blisters and itch inside your lungs! The pain can be excrutiating and it can lead to a respiratory failure. qualified medical advice. We are not doctors. Seek professional medical attention, especially if you are allergic or having severe reaction. The common sense remedy is to wash off the exposed skin as soon as possible. Bubble up, scrub yourself, and rinse off. Immediately. Some people say the oil binds to your skin within 15 minutes, others claim you have 4 hours to do the scrubbing. Always with soap because urushiol is oil and not solluble in water. You can use your regular soap, dishwashing soap, or other detergents and surfactants suitable for body contact. Take a shower rather than a bath to avoid cross-contamination from the washed-off oils and use cold water (hot water opens pores in your skin and makes you more vulnerable). There are many commercial products available at outdoor stores, pharmacies, or even department stores so read the labels and decide what's best for you. Jewelweed (also called touch-me-not) is often used as a home, or rather field remedy. Crush jewelweed stems and rub the liquid into the exposed skin. [picture coming] Jewelweeds like to grow in damp areas, moist bottomlands, and valleys with rich soil. They are also used for insect bites or stinging nettle rashes. It can relieve the itch from already developed poison ivy rash but it will need more rubbing and not all cases respond. Like most home remedies, some people swear by it, others claim it has no effect. Absolutely harmless. OK, they have thorns, but otherwise it's a very useful plant that produces edible fruit. 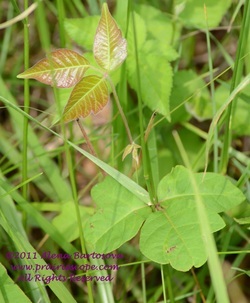 It can have three or five leaflets (poison ivy will always have three). 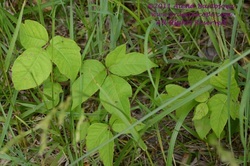 The picture on the left shows a young plant with no flower or berries at a stage where it can possibly resemble poison ivy. Just look closely at the detail photo below and you will see the leaves are serrate in a pretty regular saw-like fashion. Raspberry and blackberry plants look very similar and can be hard to tell apart. The difference is in the leaf underside: blackberry leaves have a light green underside while raspberry leaf underside is silvery. White indigo, a representative of pea family, has leaves with three leaflets just like clovers etc. The shape is very different from poison ivy. White indigo leaflets are elongate, other related plants in the pea family may have round to elongate leaves but always smooth edges with round top of the leaf. Mature Giant Ragweed is an impressively tall plant. It is also a massive pollen producer and a cause of suffering for those with allergies. If you look closely at its leaves you’ll notice that it has a single leaf with three distinct parts that have a common base where the veins come together rather than three separate leaflets connected at a stem.